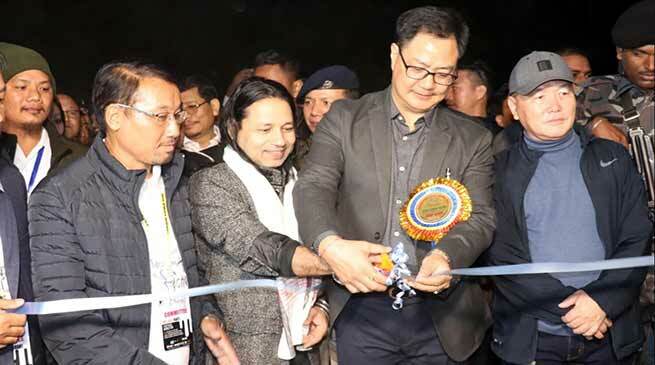 MoS Home Affairs Kiren Rijju inaugurated the 1st ever Papum Poma river festival- 2018 here toady evening. Our tradition, culture, dress and food habits are our identity which need to be preserved said Minister of state for Home Affairs Kiren Rijju during the inauguration ceremony of 1st ever Papum Poma river festival here toady evening. Rijiju said that our uniqueness should be known to worldwide for our hospitality, local food habits, living with nature and urge upon all to preserve our rich biodiversity and rich cultural heritage. we should respect and greet the visitors and tourist by recognising them ‘ athithi debo bhava’. We should not destroy our jungle and need to be preserved and that’s why we have find a place like the confluence of two river Papum and Pama for celebration of such a mega festival and termed it as ‘ jungle me mangal’ and assured his full support for all round development of state even if he is a central minister but his priority will be Arunachal Pradesh. Lauding the state government for fast progress and appreciated the state police for its development like of ‘suraksha app’ and sought support form one and all for rapid development of the area and state and lauded Minister Nabam Rebia for his concern for preservation and protection of forest and environment and other works. Under ‘swedesh darshan’ scheme a tourism project was awarded for the area and understood that it have been completed and assured his continuous support to the PPRF in future. He also appeal all not to create any incident which bring bad name for the area and such festival and our state. Minister (Environment & Forest, Land Management and SJETA) and local MLA Nabam Rebia in his address said that Papum Pama have vast tourism potential for development as an eco tourism spot which was yet to be explored. The celebration site itself is a tourist place and the downstream is a holly place where Saint Viyas stayed during his journey in these area and a Vyas Kund is available. The area need to be developed into a best tourist destination site soon if all support from all concern are extended. Terming the Papum Pama area will be converted into the extended capital like of Noida, Gazibad, Faridabad attached with New Delhi as the area is having many infrastructure like of NIT, Law college, Film & Television Institute, Entrepreneur Development Institute and many more and the vast land of the area will soon be of a great importance and appeal the people to protect the land, forest and flora and fauna as well as natural resources for our existence with nature. He assured to take up the PPRF as a calendar even from next year and appeal all to lend support in the development of the area into tourist promotion. Special guest of the event was the Bollywood rock star Padmashree Kailash Kher address the gathering and lauded the rich traditional value and hospitality of the tribal people and like the local food. He elaborated his life and his position and appeal that every one become a model for the family, society and state if he is determine for a profession which is for others service and appeal the youth for learn to live for themselves and for the fam9ily and society then the nation will naturally be supported if the youth force is utilised together for the development. He throws several numbers which thrilled the audience with huge applause. PPRF Director, John Panye inform the gathering that the festival which shall continue till December 2nd shall have lots of eco tourism activities, adventure activities, traditional sports, angling, kayaking, rafting, mountain tweaking, different food stalls, fun and cultural night every evening. He also appal all to enjoy the festival with great fun. PPRF Advisor Nabam Simon also address the gathering. DC Papum Pare Dr. Joram Beda, SP Tumme Amo, businessmen Teli Tada, BJP Papum Pare district President Tana Hali Tara, HODs, public and political leaders, Goan Buras, youths and fan of Kailash Kher were present in large numbers. Earlier the dignitaries inaugurated the food stalls of different communities of state, hot air balloon, and flagged of two medical ambulance and dustbins to the selected beneficiaries of the area.